Fireball Whisky is, of course, sold in liquor stores and bars around the country. But it’s also sold at gas stations and convenience stores. And apparently, that ubiquity has made it a sales winner, particularly in college towns where drinking games are popular. After all, if you’re losing, what better way to hammer the message home than to have a shot of hot alcohol leave a burning trail down your throat. 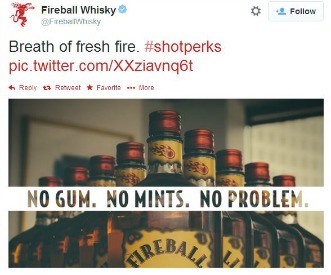 Sales of Fireball in 2011 were $1.9 million. In 2013, they were up to $61 million, not including bars. That’s more than Jameson and Patron Tequila. The reason for the spike can be boiled down to three reasons: marketers made the whisky’s presence known in college towns, offering free shots at bars; celebs like Josh Harris from the Discovery Channel’s Deadliest Catch have posted about it on social media; and brand ambassadors go bananas posting drinking games and parties online. Besides Twitter and Facebook, these brand ambassadors are also using blogs, Foursquare and Instagram to let customers know where they’re going to be and many people are likely following to get a freebie. But there’s still one gladiator to defeat in this spirited battle of spirits that pack a punch: Jägermeister. Bloomberg BusinessWeek has done a thorough feature on Fireball, its origins and its competition, writing, “… Fireball is within striking distance of Jägermeister, perhaps the most challenging of shots because of its medicinal taste. Jägermeister generated $81 million in sales last year, but it isn’t growing nearly as fast as its cinnamon-infused rival.” And based on what the article says, Fireball is going to rocket right on past Jäger. First because Fireball doesn’t have 80 years of history to live up to. But also because it’s not actually as strong as other whiskies (it’s 66 proof) and it’s marketed specifically for the masses. That marketing goes well beyond a funny motto — ““Tastes like Heaven, Burns like Hell” — and comp shots. The company behind the label is Sazerac and they keep pretty hush hush (they declined to be interviewed for the Bloomberg story), but they hired an ad agency and an Internet marketer, Richard Pomes, who traveled far and wide buying those shots that the company is giving away until he gave up the job in 2012. Now another, younger ambassador, Bob Bowling, is doling out the shots. Along with lots of women, Fireball Whisky Girls. What’s most interesting about the whole thing is the taste of Fireball and its competitors is kind of secondary. No one in the story says, “Oh this is great stuff!” The reactions to the taste are lukewarm, even if the drink is not. Instead, the whole aura about the whisky — you’re having a good time when it’s around — is what helps to sell it.